Amenhotep IV changed his name to Akhenaton, meaning "the Servant of Aten" early in his reign. Whereas his father, Amenhotep III, had sought to reduce the increasing power of the priesthood, Akhenaton practically dismantled it. Akhenaton started his reign as most Egyptian kings. But fairly early in his reign he introduced a monotheistic worship of Aten, the Sun God. At first he attempted to place temples for next to temples for other gods. Eventually he closed all the other temples and took their revenues. 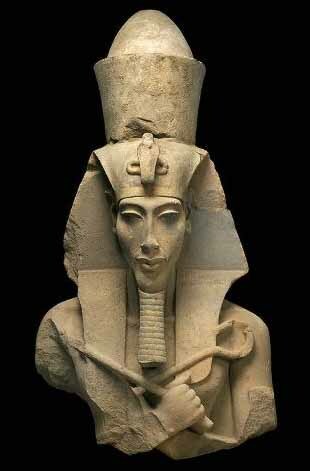 In the process of this religious revolution, Akhenaton placed him self as the intermediary between Aten and the people. This helped eliminate the need for the priesthood. As the only one with access to the god, Akhenaten established himself as a god-king and became the first king to be called Pharoah. In a move to further distance he created a new capital at Akhenaton now known as el-Armana. This sacred city had never been occupied prior to Akhenaton's moving his capital nor did it outlast Akhenaton's reign. After Akhenaton's death the backlash forced his son, Tutankhamen to reverse the move to monotheism and return to the worship of many gods. During his reign it appears likely that only the nobles embraced the Aten cult but even much of that may have been just to stay in favor with the king. Even without their temples the common people apparently maintained their old worship practices. This period of change during Akhenaton's reign has become known as "The Armana Revolution" or "The Armana Interlude". Besides the changes involving the king's position and title, the religious movements and the capital there was a new artistic style used as well. Bek, AAkhenaton's "Chief Sculptor and Master" proclaims in a stele that the king told the artists to create "what they saw". This led to the development of a more realistic style in the official art that in many cases continued on after Akhenaton's time. When the first portraits of Akhenaton and his wife Nefertiti was uncovered they were thought to represent two women because of Akhenaton's body style. Akhenaton's sculptures usually show him with an elongated neck, protruding belly and a lower body form more closely related to the way women were depicted. For awhile it was thought that Akhenaton was actually a woman. Today there is a theory that Akhenaton may have developed a condition known as Frolich's Syndrome late in life. This tumor of the pituitary gland can result in body deformations very similar to Akhenaton's depiction.